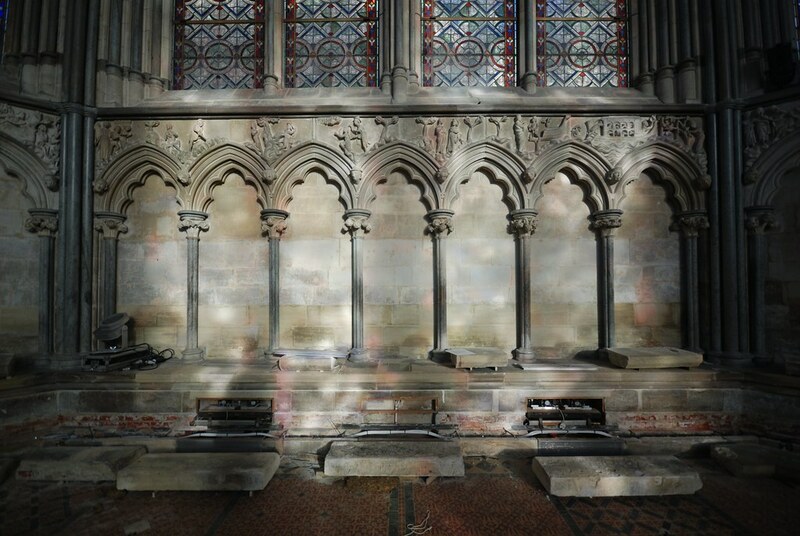 Salisbury Cathedral, housing one of the only four original 1215 copies of the Magna Carta, is this year celebrating the 800th year of its creation by hosting a new and updated Magna Carta exhibition. The exhibition is taking place throughout the year within their Chapter House, which has on display their original Magna Carta document highlighting its historical context, by telling the story of the struggle between King John and his barons using a series of displays, media, artefacts, interactive stations and film. The Chapter House, which dates to the 1260’s, is most noted for two features, the first being its octagonal shape, and the second being the highly important decorative medieval frieze. The frieze circles the interior of the room above the stalls depicts scenes and stories from the books of Genesis and Exodus which include Adam and Eve, Noah, the Tower of Babel, and Abraham, Isaac and Jacob. 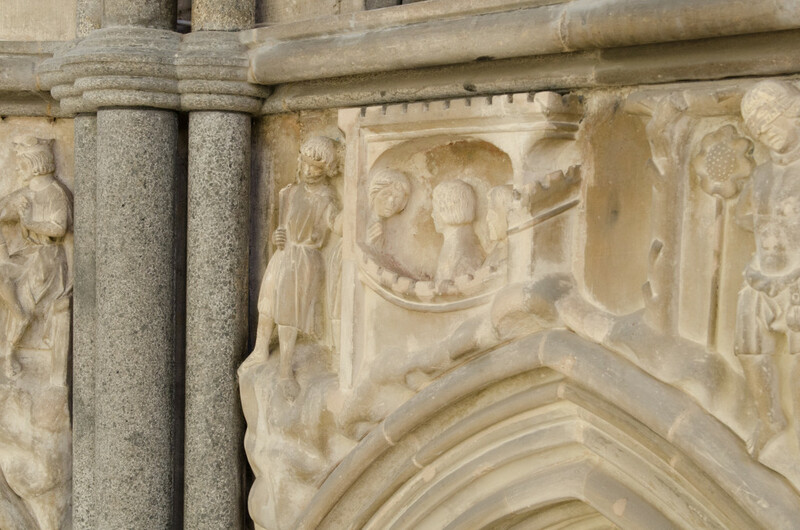 Part of this Frieze section, tells the story of King John and the struggle of justice. It was the exhibition’s wish that this part of the frieze be somehow represented within the display units that were ultimately. They tried and discussed many ways to recreate the section for display including a resin molding. Each method however could have damaged the frieze in some way. After searching for viable options, Antomic Woodworking, who were the contractors behind the display units, contacted Archaeovision to see what possible solutions we could provide. We were more than happy to help and suggested the use of 3D recording through photogrammetry which could then be processed and 3D printed. With a tight time schedule in place, Archaeovision agreed to the work and members James Miles and Paul Cripps, with the assistance of Dominic Barker (University of Southampton), began to record the frieze section in mid January for completion in mid February. 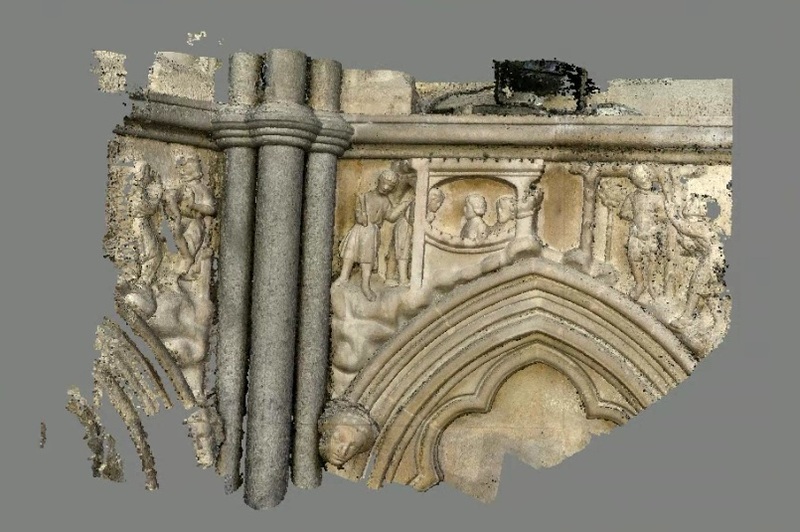 Photogrammetry was chosen as the best tool to record the section as it provided the only viable way to access certain sections of the frieze. 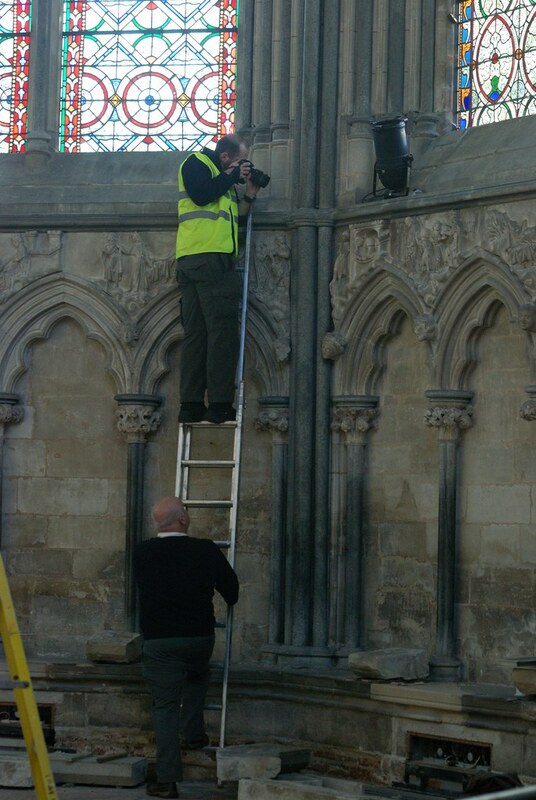 Height was a factor within this, with the section being quite high up, it meant that the use of close range laser scanning would have been impossible, without the use of a very secure scaffolding unit to avoid movement. Even with a scoffolding unit, it would have been impossible to oritentate the system to capture everything in the detail required. As well as these problems, time was major factor in the choice of photogrammetry. Time on site was limited due to the building work that was about to take place for the exhibition. As result we worked quickly to capture enough photogrammetric images that would then allow for a high resolution model to be produced. In total 492 images were captured of the frieze section. These images included various angled shots from the ground level, along with stepped height photographs, through the use of step ladders. The images from the ground were taken via a motorised Skywatcher tripod head to allow for enough overlap in the images to produce something usable. The motorised head proved invaluable as the angled shots captured would have only been possible had I laid on the ground. The images taken from the step ladders were done so by a manual process. This was mainly because the tripod could not reach so high but in general it allowed for more control in capturing the close up details required. The frieze section was in an extremely hard location to record, with the column positioned next to the area of interest. Special attention therefore had to be taken in recording this area, as problems would exist in the model if the images taken did not capture the surface detail in between the column and frieze section. Special care also had to be taken through the manual process to avoid subtle movement (blurred images) otherwise the images would be incorrectly aligned when processed. Although 492 images were taken, not all of these were used within the processing software, as not all of them were needed to produce the necessary model. A subsection of these were therefore used and were processed in Agisoft Photoscan, which we have a long reputation of using and promoting through our reseller rights. The images were carefully selected, whereby any out of focus shots and any images that were near enough the same were removed. The model was processed under normal settings, with the alignment of the photos completed using no masks and the production of the dense point cloud completed of the entire area captured rather than just the area of interest. This meant that we could check the quaility of the images used, as the results should have shown a number of errors outside the area used to focus the images. Fortunately this was the case as seen below. The dense point cloud was then edited by removing all of the data other than the frieze and the meshed model was then processed with a texture added. 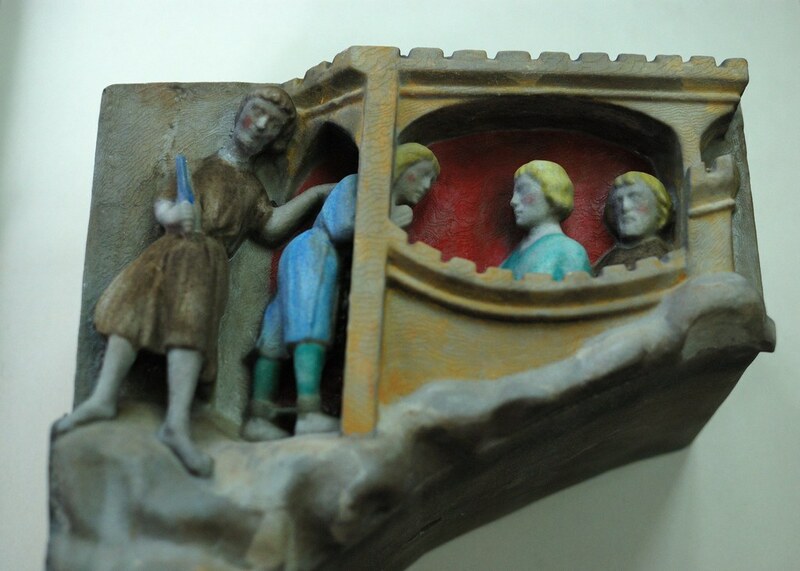 The resulting model produced an exact replica of the frieze section to a high enough quality whereby it could be 3D printed. As the 3D print would be placed within the exhibition, it was agreed that a virtual base would be created and incorporated within the model so that a more whole model could be printed rather than just the surface detail. This model was then exported and reprocessed in various different modelling software to create something that could be printed. The entire model was made hollow and holes were digitally cut into the base to allow for the removal of the extra powder when printed. As the model had been edited, it had meant that it lost its texture. As such the model was realigned to its original position and imported back into photoscan whereby the texture could be reapplied. The model was then exported as a watertight meshed model and was scaled to the correct size of the printer. The 3D printing was completed through the University of Southampton’s Engineering and the Environment department, who we have a close connection to. The printer used was a ZPrinter 650 which prints at a resolution of 600 x 540 dpi at a rate of 28mm per hour. It is one of the largest and best printers available on the market and it produced a 3D print that is extremely detailed in quality. To save on time and cost for the project, the holes and hollowness of the model mentioned earlier, meant that the print used less material. This in turn meant that the print was completed in less time which then allowed for us to complete the work within the given time frame. The 3D print was slightly smaller than the original piece due to the limitations of the printing size available. Although the model could have been altered to allow for two sections to be added together, it was decided that one solid piece would be best as the visual appeal may have been altered if a joining feature was evident. The print was then given to the exhibition staff who then painted the print to add the original colour that once covered the entire frieze. The exhibition staff are extremely happy with the final print and are thankful that we were able to step in at the last minute to help produce this important feature for their display. 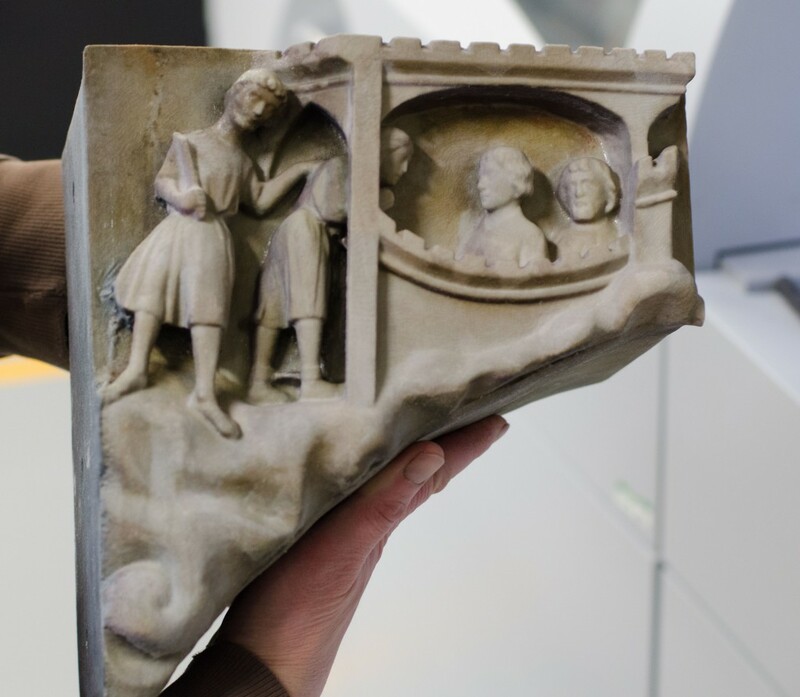 This 3D print is now publicly viewable at the Cathedral and we would recommend visiting the new exhibition to see the Magna Carta in person, along with all of the other displays that are on show. 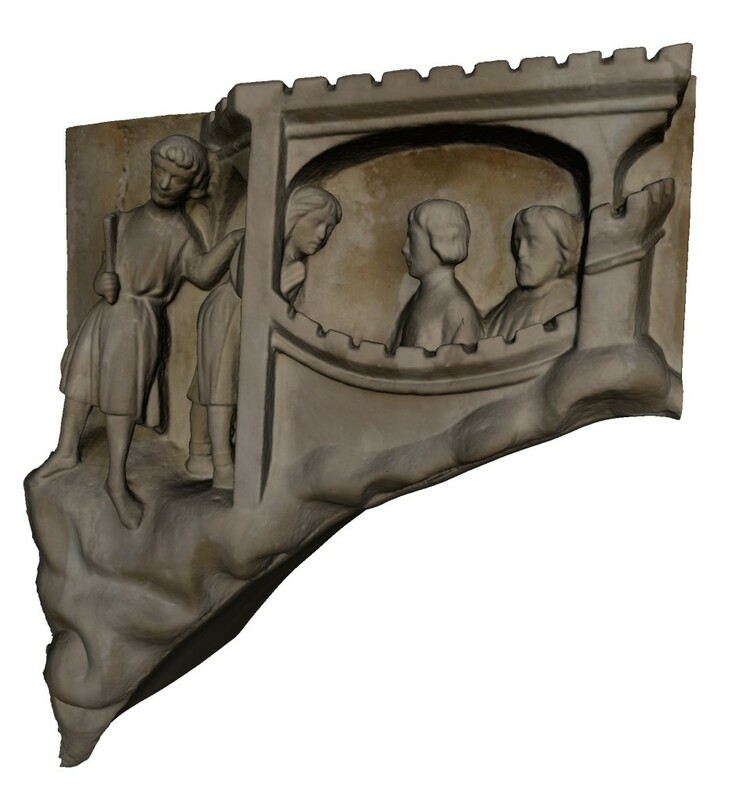 For those however that are unable to visit the cathedral, we have made the model available online so that you can see the quality and detail that went into the original carving of the frieze.